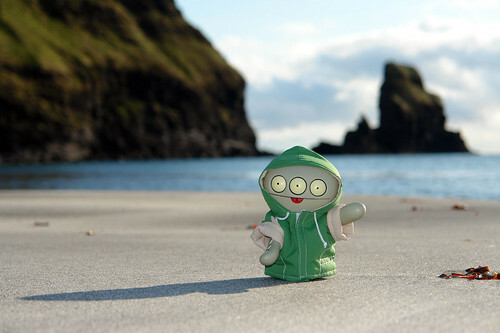 Uglyworld 514 - Hello From Talisker Bay (131-365), originally uploaded by www.bazpics.com. The day had been quite changable as far as the weather goes, in the morning we had nothing but blue skies, which had turned to drizzle by the time we had explored the coastline at Tarskavaig, and then swapped about almost every 30mins. When we arrived at the start of the small path which winds it's way to the beach at Talisker Bay Cinko opted to put his jacket on "justs in cases it rainsies again". Thankfully the rain didn't start up again, but Cinko decided that he made the right choice anyway!